Tube complement: 12SK7 RF, 12SA7 mixer/oscillator, 12SK7 IF, 12SQ7 detector, 35L6GT audio output, 35Z5GT rectifier. Approximately 10-3/4 inches / 273 mm wide, not including the tuning knob on the side. 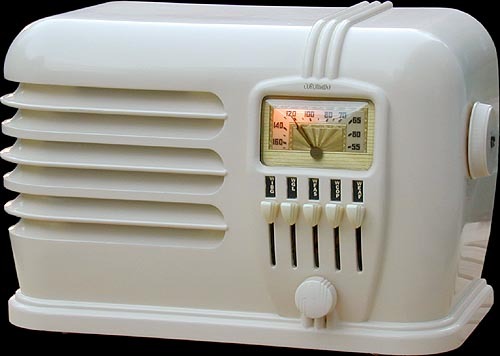 This radio's finish is ivory paint (original) over Bakelite. Most of the Coronado decal (above the dial) still remains. This is the back view of the Coronado 636. Even though an effective loop antenna is built in, a terminal for an external wire antenna is provided. One finds this terminal on almost all loop-antenna-equipped radios of the 1930s and 1940s. Today there are so many AM stations, they are all so strong, and there's so much interference from electric appliances and poorly maintained power lines that it's difficult to imagine a time when an external antenna would have been useful. 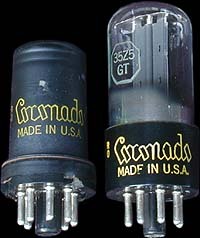 These were the only Coronado-branded tubes still in the radio when I received it. They were no doubt original equipment but, alas, they were both bad and had to be replaced. So now this set has none of its original tubes, all having given their lives in long service to at least one listener's entertainment. 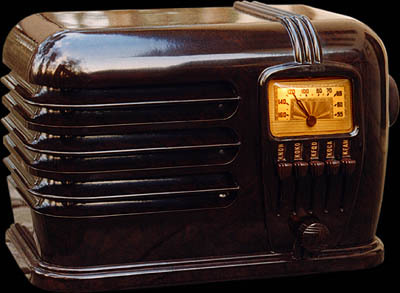 This is a Belmont 636, an unpainted brown Bakelite version of the radio above that the OEM sold under its own brand name. 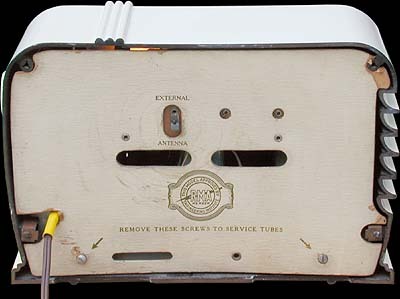 In contrast to the Coronado, five of the six tubes in this set are the original Ken-Rad tubes. All five have the same date code, "M0," indicating that the tubes' warranty expired December, 1940. Don't think that Ken-Rad tubes last longer than Coronado tubes—both brands were made in the Ken-Rad factory, on the same production lines and in the same way. The only difference is the label. The Belmont radio must have seen little use compared to the Coronado.